Gold Wing® Airbag, FOG LIGHTS, PLATFORMS W/HEEL-TOE SHIFTER, HYW PEGS, CUSTOM WINDSHIELD, TRUNK RACK, BAKER AIR WINGS AND INT FT/RR LIGHTS. 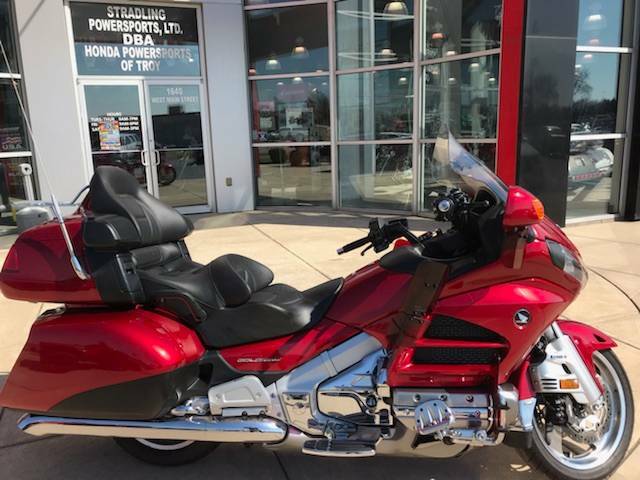 Plan To Go Everywhere There’s big news when it comes to the new 2014 Honda Gold Wing®: we’ve taken the world’s best touring motorcycle and made it even better. The new bodywork is the first thing you’ll notice, complementing the best engine and chassis package the touring world has ever seen. 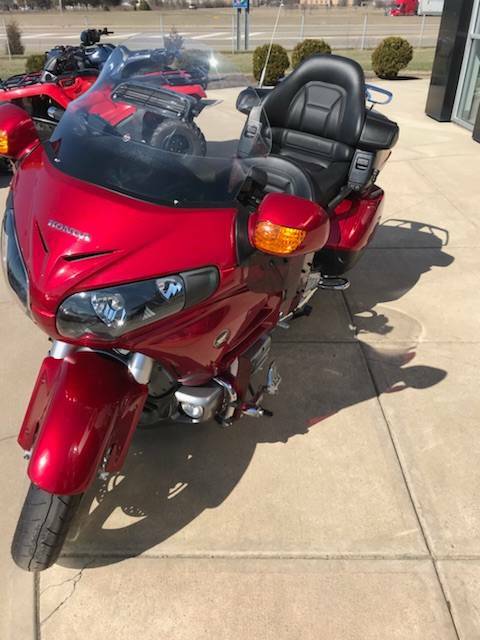 Look a little further and you’ll discover great new improvements to the audio system, the available navigation system and the Gold Wing’s comfort, too. There’s new functionality as well, like integrated iPod® connectivity and the ability to upload trips to the Navi system from your home computer. If you thought the Gold Wing was the world’s ultimate touring motorcycle, you were right. And if you think the new Gold Wing is even better, you’re right again. 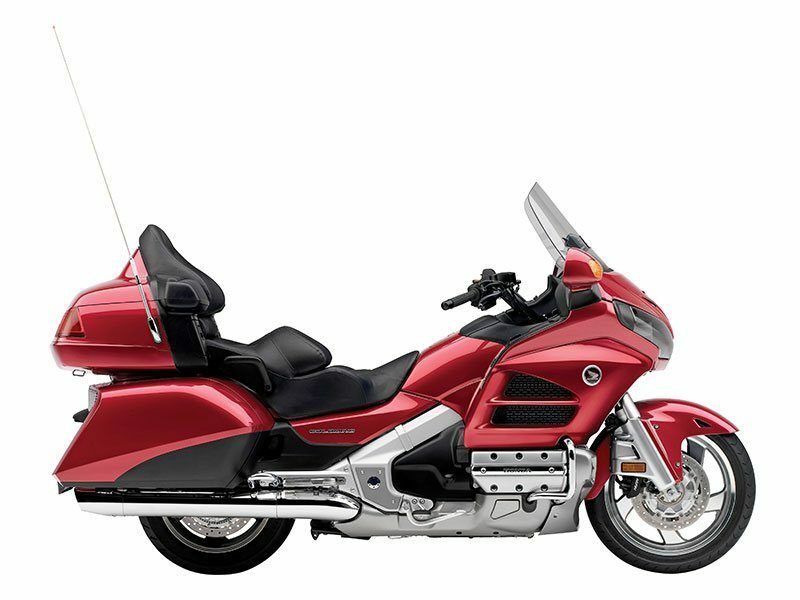 The Gold Wing’s fuel-injected, horizontally opposed six-cylinder engine is exceptionally smooth and incredibly powerful. This time-tested powerplant delivers plenty of useable power, using regular unleaded fuel. And to eliminate crankshaft-induced torque reaction at the chassis, the gearbox spins opposite the crank’s rotation—an elegant solution, and a typical Gold Wing engineering touch. Our sturdy, ratcheting windscreen adjustment system provides six settings over nearly 4" of travel. The airbag-equipped Gold Wing boasts the industry’s first and only production motorcycle airbag system. The motorcycle’s fork incorporates two sensors to detect a frontal impact. Someday all motorcycles may offer this feature, but right now only a Gold Wing gives you this choice. Our wheels are clear-coated from the factory for an improved appearance and easier cleaning. 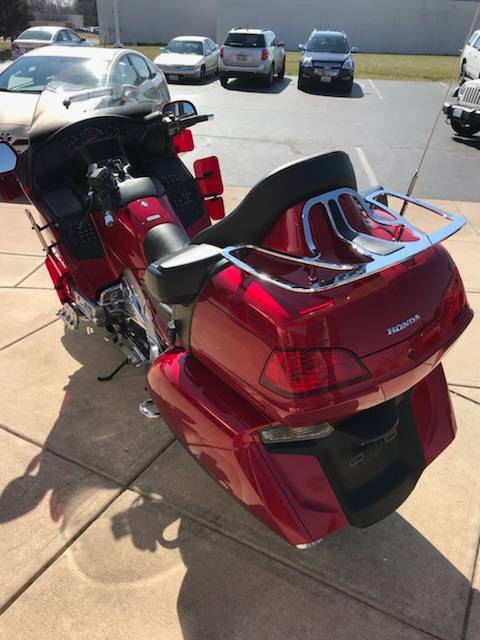 When we redesigned the new Gold Wing’s bodywork, we took the opportunity to increase the storage capacity in the saddlebags by seven liters, upping total capacity to over 150 liters including trunk and fairing pockets. The Gold Wing Features heated grips, a heated rider’s seat and a heated passenger seat/backrest, all with individual rider and passenger controls. There’s even a foot-warming system for cold mornings! The 2014 Gold Wing’s layered-surface bodywork does more than just look great. We took the opportunity to fine-tune the rider and passenger environment. There’s appreciably more wind and weather protection around your lower legs, so you’ll experience less buffeting and warmer legs on those cool days. Now you can connect a compatible Apple® iPod® player or other USB mass storage devices, such as flash drives that contain MP3, WMA6 or AAC music files, and control them through the Gold Wing's audio controls. The connector is located in the lockable trunk, where devices can be conveniently carried and discreetly stored. 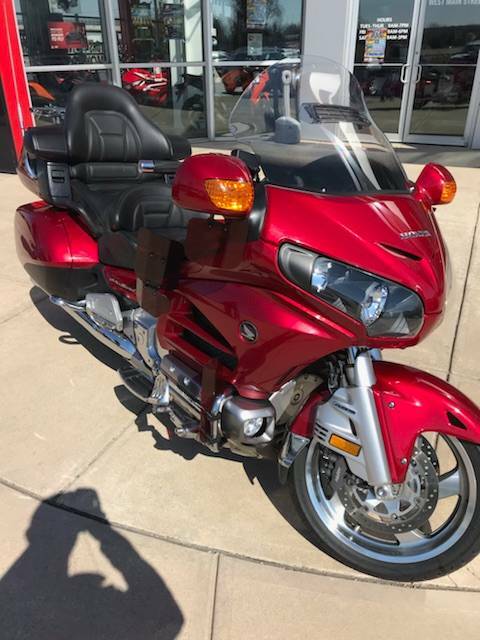 The Gold Wing’s design aims for a more integrated appearance, with a sporting edge and visual flow line linking the front to the rear, and a new, integrated taillight and saddlebag treatment. Other touches include redesigned front fascia and air intake, blacked-out headlight garnish and new instrument panel fonts and design. The Gold Wing’s MotoGP-inspired single-sided cast-aluminum swingarm is super rigid and lightweight, with reduced unsprung weight, delivering sharper, sportier handling. Its unique Pro-Arm design mates up with Honda’s patented Pro-Link rear suspension, featuring electronically adjustable hydraulic preload settings for various riding and load conditions. Suspension settings are a part of the reason your Gold Wing offers handling that can put many a sportbike to shame. Gold Wings have always offered the best overall handling of any touring machine, but these settings really improve things when you decide to dial it up a notch. 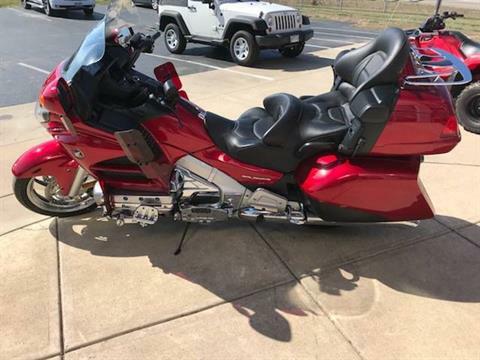 Our exclusive Honda design and technology gives you the best available fully integrated GPS-based Navi system on two wheels, featuring a brighter color LCD screen and step-by-step verbal directions via Gold Wing’s sound system. And new for 2014: a new lane guidance feature, junction view, 3-D terrain view and a new GPS receiver that captures satellite signals faster. Plus, with TripPlanner.Honda.com, you can plan trip routes on your home computer and upload them into your Gold Wing’s Navi system. The best seat in the house just got better. Both the rider and passenger will feel the difference that our new urethane seat material makes. The waterproof cover also features a new sportier, custom-perforated look too. A day in the saddle never felt so good! Checking tire pressure can be a hassle—except when you’re riding a Gold Wing with our Tire Pressure Monitoring System (TPMS). 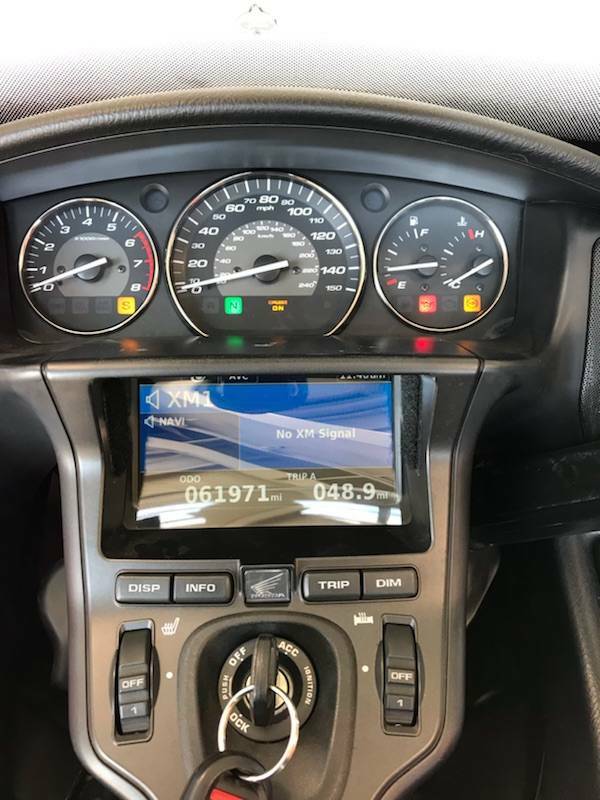 A pair of monitors keeps track of both front and rear tire pressures, and the dashboard readout is updated once per minute. They’ll send you an alert if either tire is significantly underinflated.